Looking for a fantastic holiday cookie that not only tastes amazing, but is packed with healthy ingredients? We’ve got just the cookie for you! 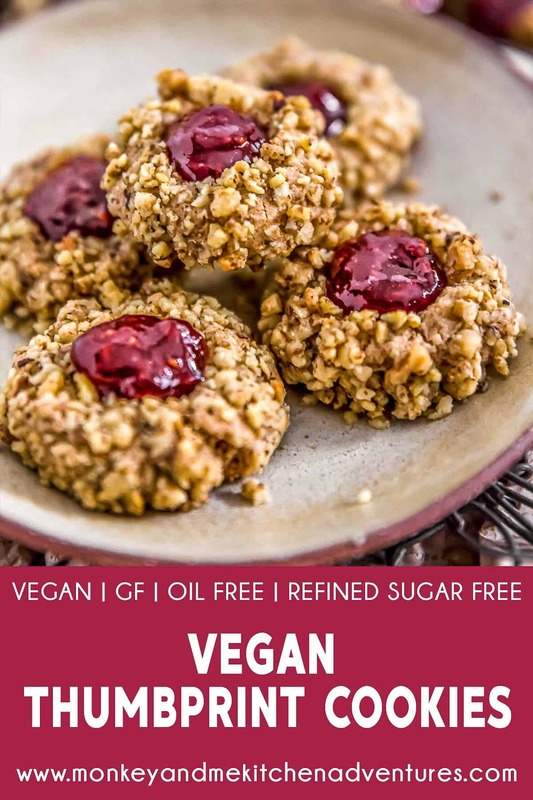 Our Vegan Thumbprint Cookies are a delicious classic holiday cookie that is sure to put a smile on your face. Thumbprints are always a beautiful addition on every Christmas cookie platter. 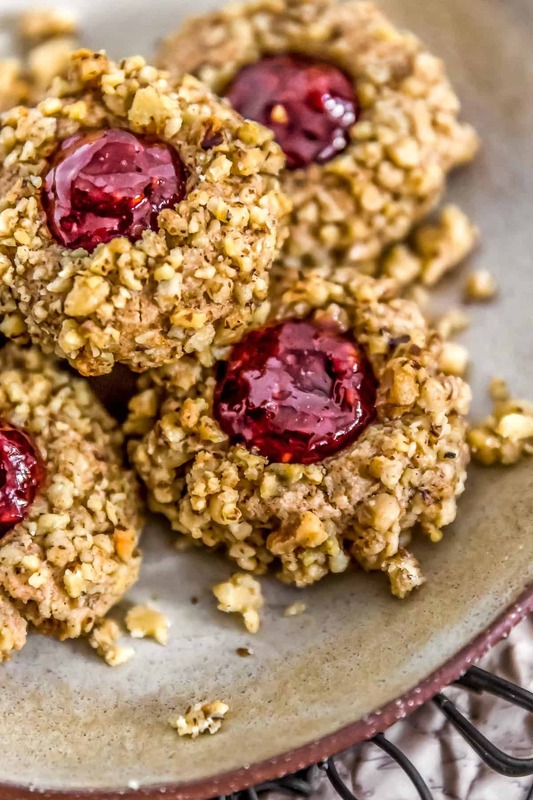 These cookies are buttery, light, and filled with delicious jam. They are sure to make your holiday dessert tray shine. Whole Food Plant Based, vegan, plant based, oil free, refined sugar free, gluten free, no highly processed ingredients. I’ve been baking thumbprint cookies since I learned to hold a wooden spoon, over 50 + years now. While growing up my mom, my Aunt Sue, my sister and I would bake massive amounts of Christmas cookies. When I say massive, I mean HUGE quantities of holiday cookies of every variety you can possibly think of. 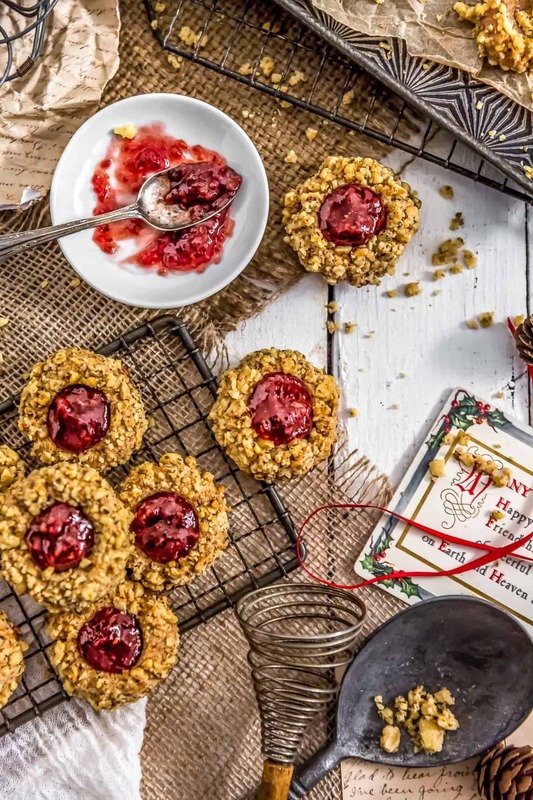 One cookie that is a holiday classic is Thumbprint cookies, filled with all different types of jams and jellies. Beautiful little thumbprint cookies filled with raspberry jam is one of my absolute favorites. My sister and I would always get excited whenever my Aunt Sue came over to help with the holiday baking because my mom and Aunt Sue knew how to make baking cookies a lot of fun. We always had a blast. It was a lot of laughing and light-hearted good times. I miss those days. Time flies! I could always count on Monkey to help with the holiday cookie baking. From a very young age, she loved to bake, and I passed down that love of cooking and baking to her. When she got older, she then started to bake and sell her holiday cookies until it got utterly ridiculous during the holidays. We were baking our hinnies off. The oven was literally running 24/7. We finally called an end to selling holiday cookies a couple of years ago since it was just too much to meet the demands and we then went Whole Food Plant Based. 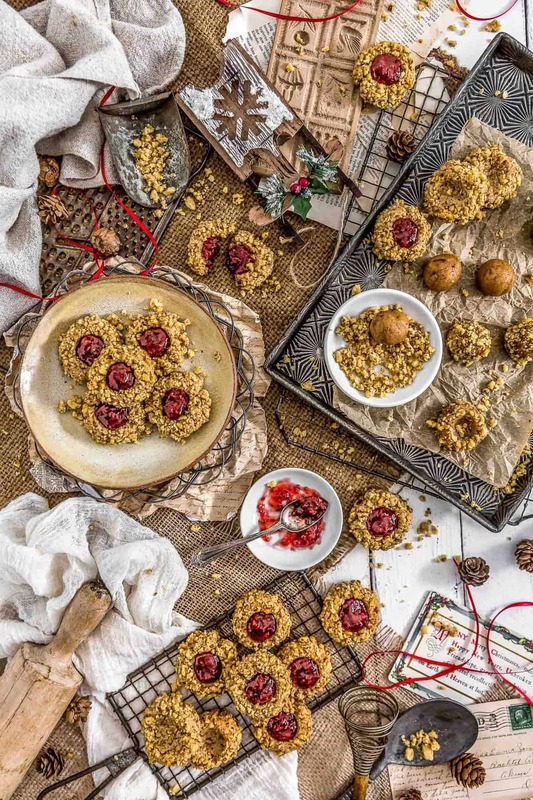 Monkey and I did not want to give up our holiday cookie baking extravaganza when we went Whole Food Plant Based, but we knew that we needed to do some seriously reworking of our holiday cookie recipes in order to make the WFPB compliant. We did tons of kitchen tests. It was really important to me that we got the thumbprint cookies down pat as they are a family favorite. 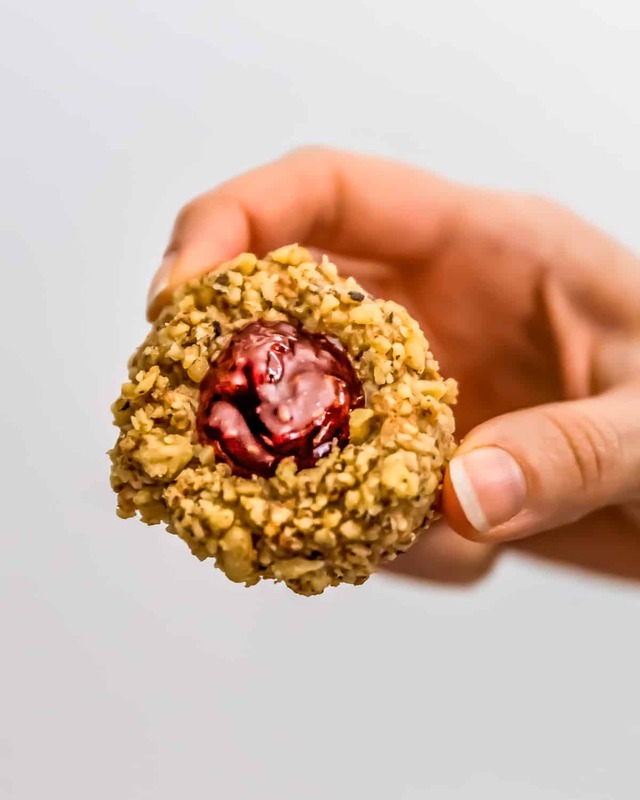 We are so happy to share with you our amazingly delicious WFPB thumbprint cookies. I’ll let Monkey tell you more. When Mom said we made massive amounts of cookies, she wasn’t kidding. We baked holiday cookies for weeks on end. We made every possible cookie you can think of. Now, we are in the business of converting the majority of our traditional holiday cookie recipes over to WFPB complaint cookies. AND . 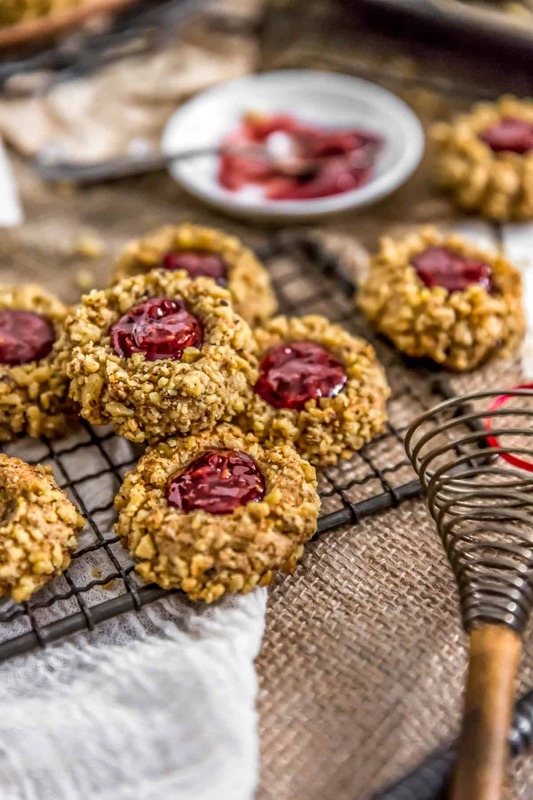 . . we are so happy to share with you this delicious Thumbprint Cookie. It is sooo GOOD. It has this beautiful light cookie texture, covered in toasty walnuts, and filled with raspberry jam. You can use any jam or jelly you wish. We used raspberry just because it says “holiday” to us. We would love for you to give them a try! We just know you are going to love them. If you try this recipe, we would love to know if you love them as much as we do. Please leave us a review! Looking for more tasty cookie recipes? Looking for a fantastic holiday cookie that not only tastes amazing, but is packed with healthy ingredients? We've got just the cookie for you! 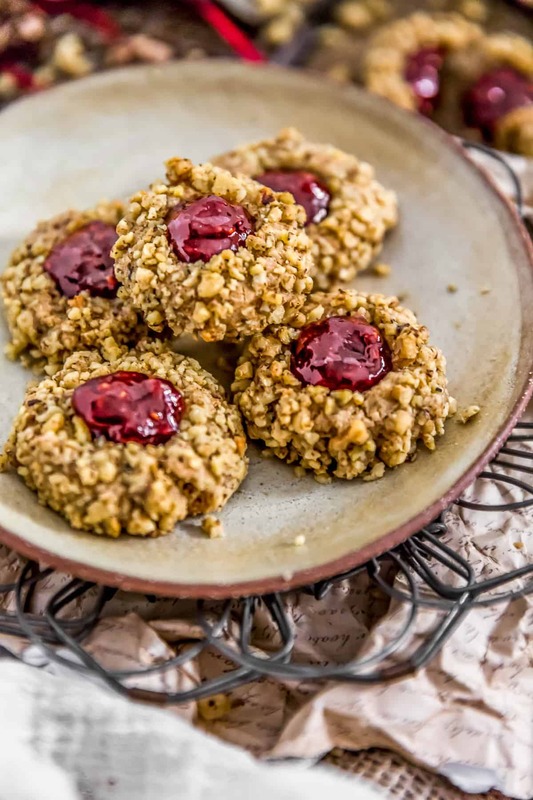 Our Vegan Thumbprint Cookies are a delicious classic holiday cookie that is sure to put a smile on your face. Thumbprints are always a beautiful addition on every Christmas cookie platter. 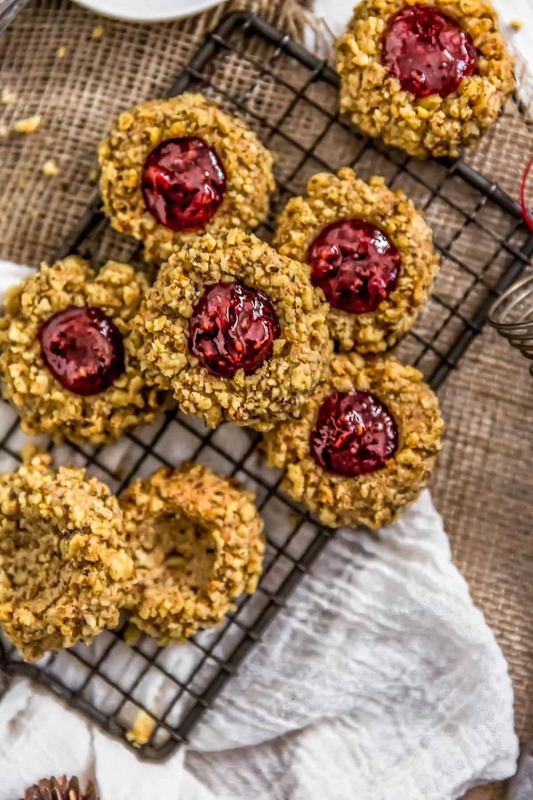 These cookies are buttery, light, and filled with delicious jam. They are sure to make your holiday dessert tray shine. 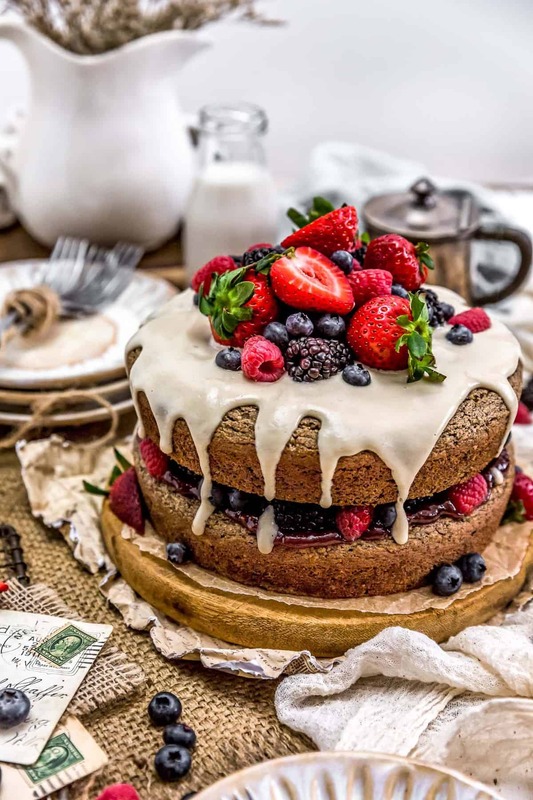 Whole Food Plant Based, vegan, plant based, oil free, refined sugar free, gluten free, no highly processed ingredients. Preheat the oven to 350 F. Place oven rack(s) in the center position. Line one (or two) baking sheets with a silicone mat or parchment paper. We used a silicone mat. Set aside. Place the Medjool dates in a food processor and process just to break them up, about one minute. Then add all the remaining ingredients into the food process (except the walnuts and jam) and process until everything is mixed well and the dough forms a lump. Use a small cookie scoop or tablespoon to scoop up the cookie dough, roll into a ball and place onto a plate. Once all the cookies have been rolled, fill a small bowl with a water, and then place the finely chopped walnuts onto a plate. You are setting up 2 stations. One for dipping the cookie ball in water and the other for rolling into the walnuts. Take a nicely rolled/round dough ball and briefly dip it into the water, then immediately roll it into the chopped nuts. Slightly press the nuts into the cookie to ensure they adhere, but don’t press too hard. You want the cookie to remain round. Then place the cookie onto the silicone mat or parchment paper covered baking sheet(s). We used a silicone baking mat. Once all the cookie balls are rolled into the walnuts and have been placed onto the baking sheet, take your index finger (or thumb) and press it firmly into the center of the cookie ball to create a deep and slightly wide indentation. The cookies will rise slightly so you want a clear indentation. Do not break through the bottom of the cookie. Continue until all the cookies have an indentation. Place the unbaked cookies into a preheated oven and bake for 11 minutes. Then remove from the oven, allow the baked cookies to remain on the baking sheet for 5 minutes to firm up, then transfer to a wire cooling rack. Once the cookies have completely cooled, fill each cookie with raspberry jam (or jam of your choice). *Medjool dates and Maple Sugar: We get tons of questions about sweetener substitutions. We totally get it. Some folks want to use all Medjool dates, while others want to use all maple syrup. We’ve tried these cookies using all Medjool dates, they turned out gummy. We also tried using all maple syrup, they just didn’t hold up. 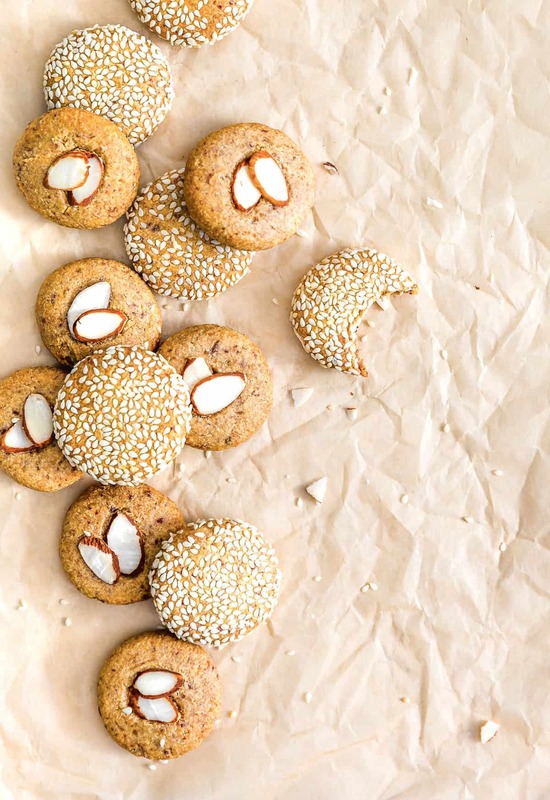 Honestly, the best sweetener for this cookie recipe is the combination of Medjool dates and maple sugar. Additionally, using date sugar is not recommended either as it just doesn’t have the same flavor and texture needed for this recipe. ***We also get a lot of questions about using coconut sugar, if your diet permits, you can substitute coconut sugar for the maple sugar. 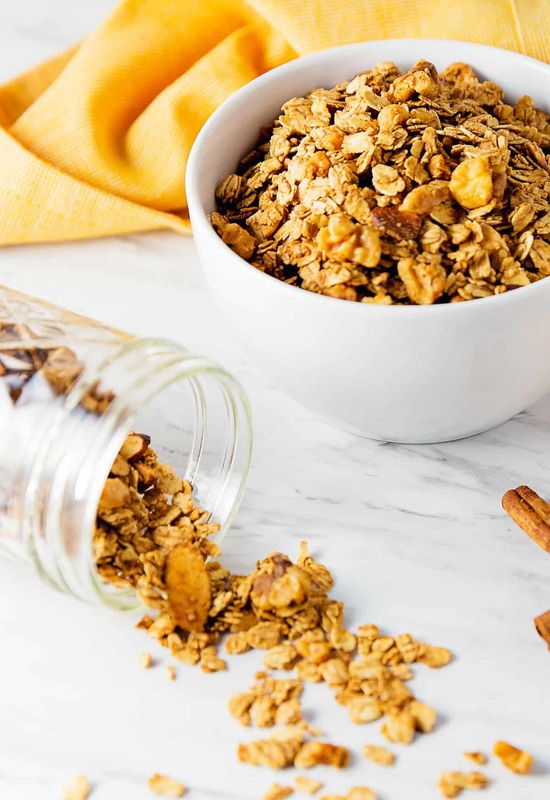 However, we have not tested with coconut sugar; many of our readers have let us know that coconut sugar works well as a substitute for maple sugar. *Medjool dates: If using Medjool dates vs another dried date, there is no need to soak the dates as Medjool dates are typically very soft. However, if you are using a different date, test the date by pinching it. If the date is soft, gooey, and pliable, then you can just add them to the food processor to break them up. If the dates are drier and stiff, then you will need to cover them with boiling water for about 20 minutes to soften them up before adding the dates to the food processor. *Almond Butter: Most almond butter is generally already very soft; however, some brands do require refrigeration after opening and it becomes rigid when cold. 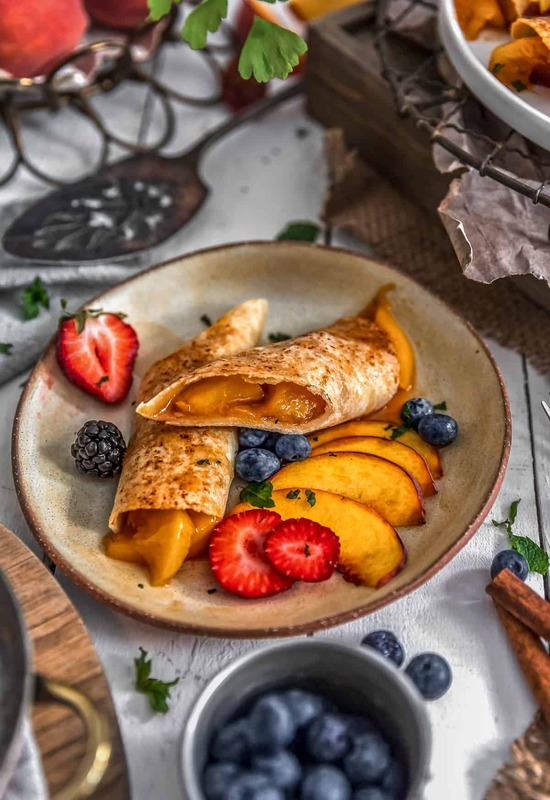 If you are using an almond butter that has been refrigerated, then heat it up in the microwave for about 25 seconds or remove the required amount from the refrigerator and allow to come to room temperature before stirring in. It is difficult to distribute refrigerated almond butter evenly throughout the batter as it tends to lump up. You want it softened, not melted. *Jam: We love St. Dalfour’s France All Natural Ingredient Jam as it is 100% fruit. *Serving: Makes approximately 25 to 28 cookies. *Storage: Use within 5 days. Freezes well without the raspberry jam filling. Where is the best place to buy maple sugar? This is good to know! Thank you! I am learning to use dates a lot more in place of sugar. Love the cookie recipes you guys have! I can’t understand why people need so much sugar in their desserts! Dates are a great replacer! I am a breast cancer survivor and trying to be alot more whole foods based when it comes to my eating. So I may not pursue getting maple sugar. Trying to cut out refined stuff in my diet. I was eating pretty good prior to my cancer dx. So am just being really careful.